Here's a great all-around arbor for use with dado blades or the Shopsmith Molder Head. 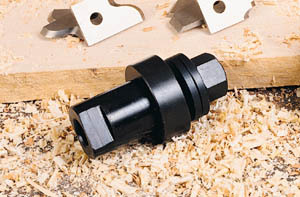 Includes a 3-1/8" long 5/8" diameter threaded shaft, two steel washers, a 3/4" thick spacer, a locking tongue-washer and a hex nut. Fits Mark 7 and all Mark V models. Having extras allows you to have a variety of tools ready to go to work on a moment's notice... without bothersome change-over. Not for use with the Shopsmith 10-ER, Mark 2 or old Mark VII. Note: Cannot be used with regular saw blades, see saw blade arbors here .